September 2018 update: Note that I now have a new recipe for pliable gluten-free wraps with a consistency closer to that of wheat wraps. These here are more crepe like. Hello dear neighbors ! 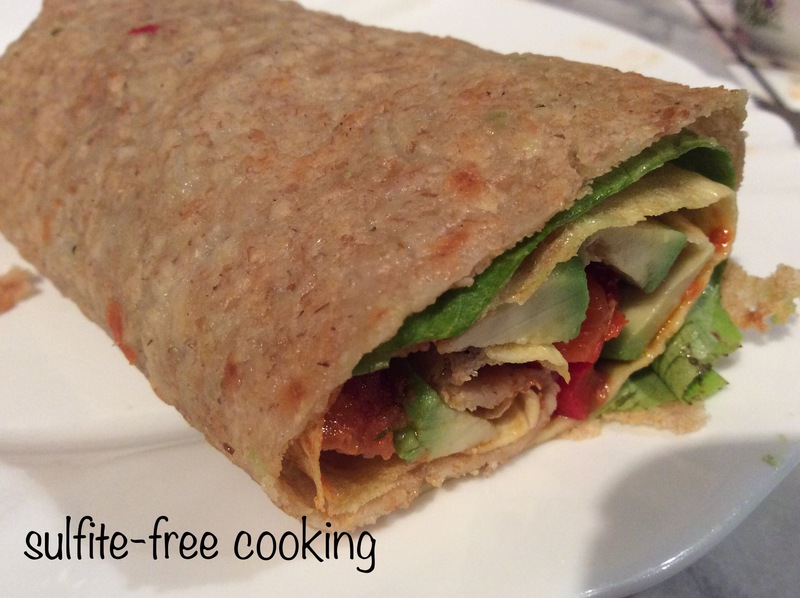 Here is a recipe for gluten-free wraps that I have been making for a while now. They are made with millet flour, along with ground gluten-free oats, which I really love for the soft texture they give the wraps and also because they balance off the slight bitterness brought on by the millet flour. Between my universal GF pie dough, my quince pancakes, and fake Sn****rs bars, I really don’t know how I would manage without my gluten-free oats ! What I like about these wraps, besides their taste (my husband is very fond of them), is that they are easy to make, can be stored in the freezer, and do not contain eggs. Those I save for the filling (ideas on how to fill the wraps below). They have another use in my kitchen, but I haven’t taken any photos yet. As always life is quite busy around here : I have been painting shutters and railings, it had to be done before the cold settled in, which it has ! Chip and Dale have been coming back in the hope of finding more walnuts… Seems they have already forgotten that they pillaged our backyard back in early October !!! Please note that the batter needs to rest for at least 2 hours before making the wraps. 1. Grind the oats and flaxseed, mix with the rest of the dry ingredients. With a fork, gradually beat in the warm water. Cover and set aside to rest in a cool place, such as the window sill at this time of year. The batter must rest for at least two hours so it can thicken. I have occasionally prepared it in the morning, or even the day before, and set it aside until cooking time. 2. Before cooking your batter, stir it well and add a couple of TBSP water to loosen it a little. It needs to be thin enough so it will be easily poured and swirled onto the surface of the pan. 3. Warm up a slightly oiled frying pan ; lift from heat, pour a ladleful of batter and swirl the batter, moving your wrist in a circular motion so it fully coats the pan, just as you would for a crêpe. Cook one side, then the other, then flip again to cook some more, and another time for the second side, all this on medium or low heat. You need to make sure each side is cooked thoroughly. Note that the wrap will shrink away from the the edges as it cooks and the water evaporates. As with crêpes, don’t worry if the first wrap does not come out as nicely as you want it to. Some people in France call it the « crêpe témoin », or, loosely translated, the « beta crêpe ». The next ones usually come out fine. Don’t forget to 1) brush the pan with oil and 2) stir the batter between two wraps ! It’s all up to you, dear neighbor. Your suggestions are of course very welcome ! Lovely recipe, dear Joelle! Thank you for sharing. You are welcome, Dolly 😊. I made a big batch of these wraps yesterday that went into my freezer, in anticipation for my kids’ Christmas vacation with us! Have a good Shabbat, Dolly! Thank you so much, dear Joelle!